The Big Question: Gas or Charcoal? Charcoal grills are great for those of us who really enjoy playing with fire. They take longer to get started and require more meddling, which can be a pro or a con depending on your personality. If you love the hands-on aspect of cooking with charcoal and don’t mind the cleanup, go for a charcoal grill. 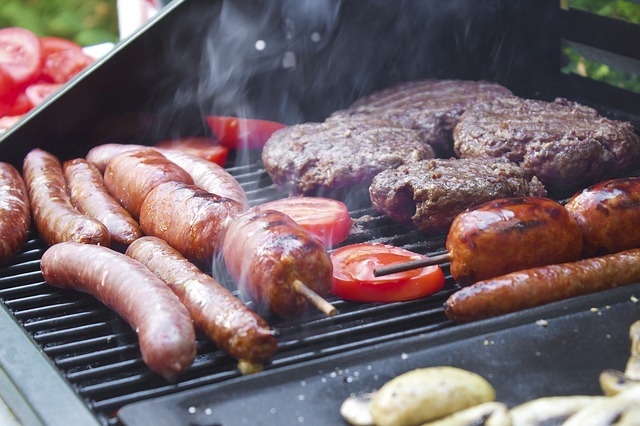 If you don’t enjoy the idea of fiddling with the briquettes and in fact know it might stop you from using the grill regularly, then go for propane. If you like to be able to control the temperature precisely as you cook, a propane grill is for you. It also heats up faster than charcoal, so it’s better for quick meals. With a charcoal grill, the temperature is not easily controlled (i.e. you can’t just turn the heat down with a knob), and so it takes more experience and trial and error to get things just right. Charcoal grills can, however, reach higher temperatures, so if you like your steaks rare in the center and browned on the outside, charcoal makes that easier to accomplish than a typical propane grill. Most people won’t be able to taste the difference between burgers or chicken cooked on a charcoal grill versus a propane grill. However, if you’re interested in slow-smoking ribs or other low-and-slow cuts, the smoke from a charcoal grill can make a difference in the flavor. Still not sure which you’d prefer? Then let your budget be your guide. In terms of initial investment, a quality charcoal grill is much less expensive than a quality gas grill. Once you select the type of grill you’d like, take a look at the available space in your backyard. Of course, the smaller your patio, the smaller you’ll want your grill’s footprint to be. Also, for safety, you’ll want to keep your grill 10 feet away from your home and away from any overhanging awnings or branches (this is especially important for charcoal grills). But you’ll also want to consider the layout of your outdoor living space. Do you want a clear path to the door so you can bring the plate of steaks straight inside? Do you have an outdoor table that you’ll want to keep away from the hot grill for the comfort of your guests? Also consider if you’d like to have just a freestanding grill or the added preparation space provided by a barbecue island or even a fully equipped outdoor kitchen. If you’re ready to find the grill of your dreams, then let the grill experts at Unlimited Outdoor Kitchen help you find the grill that fits your lifestyle and budget. Still not sure what you’re looking for? We’ll be happy to help you find the right match.